Konza Techno City is a developing world class technology hub, located within Machakos District Kenya, approximately 60 kilometres from Kenya’s capital city, Nairobi. The A109 highway will connect the planned Konza city to all major surroundings, including Nairobi, Jomo Kenyatta International Airport, and Mombasa. The 20-year project will be developed in four, five-year phases for a total estimated cost of US$7 billion (AU$ 8.46 billion). Konza Techno City aims to transform 5,000 acres of land into a globally recognised technology hub, focusing on the four economic sectors: Education, Life sciences, Telecoms, Information Technology Outsourcing (ITO) and Business Process Outsourcing (BPO). 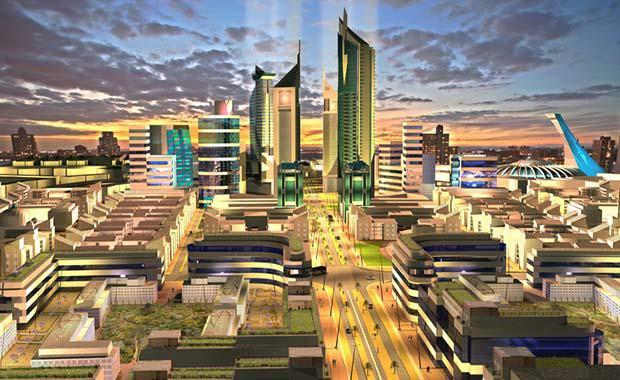 The master plan for Konza Techno City was inspired by successful new city projects from around the world. The developers have drawn on elements of successful new developments across United Kingdom, China and Brazil, to ensure its position in the global market. The active public realm and mixed-use facilities will create a high quality life allowing people to live, work and play within walking distance of their home. Once completed Konza Techno City will welcome over 17,000 workers. Konza Techno City Pavilion will be the first building in Konza Techno City. The developers say the pavilion will be an iconic landmark building that serves the public and houses early city management functions. Once completed, the building will showcase cutting edge technologies and will be engineered as a green and environmentally responsible structure. One of the most striking features of the pavilion will be the rooftop canopy. The canopy evokes the shade of an acacia tree in the open landscape. SHoP Architects of New York, local architects and university students. According to East Africa Economic Report the first phase will cost an estimated US$2.3 billion (AU $2.78 billion) of which infrastructure will cost US$1 billion(AU$1.2 billion). The rest will be spent on the development broken under: the ICT Park US$200 million (AU$242 million) , Residential US$975 million (AU $1.17 billion) and the Central Business District will cost US$125 million (AU $151 million). The second phase will cost an estimated US$1.7 billion (AU $2 billion) of which infrastructure will cost $400 million (AU $483 million) ; the residential area will cost US$850 million (AU $1 billion) while the CBD will cost another $100 million (AU $120 million). The third phase will cost an estimated US$2.1 billion (AU$2.5 billion) of which infrastructure will consume US$600 million (AU$725 million). In the final phase, BPO will cost $450 million (AU$544 million), residential $250 million (AU$302 million), Science park US$100 million (AU$121 million) while infrastructure will cost US$150 million (AU$181 million).